This year’s conference proved to be a resounding success. 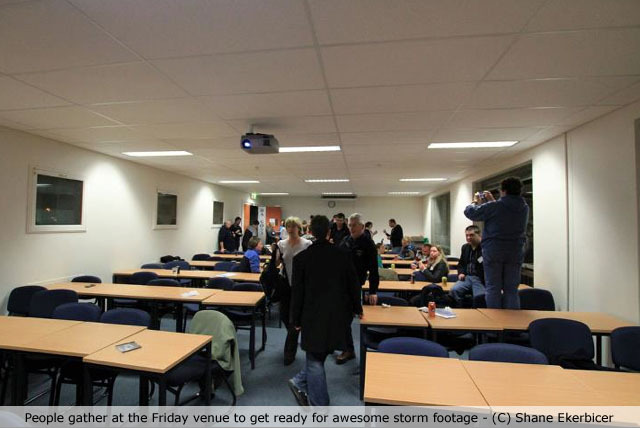 Those who attended witnessed exceptional severe weather footage, educational and informative presentations and of course had the chance to catch up with some old friends and the opportunity to make some new ones. For many, visiting Canberra is as much a holiday experience as it is a national educational experience. Canberra hosts many of our national treasures; the War Memorial is one of these. A handful of our attendees took full advantage of a personalized tour of the complex, hosted by Clem Davis from ANU who also volunteers as a guide at the memorial. Clem took as through the various wars with humility and insight, which we’re sure those who attended walked away for a newfound respect for those who gave up the ultimate sacrifice for our country. ASWA would like to thank Clem for giving up his afternoon for our members. This event was viewed from a lecture theatre style arrangement within the ANU, along with delivered Turkish Pizzas, which everyone enjoyed thoroughly. ASWA believes that the quality of footage shown would rate as one of our best video nights ever! What a way to start our weekend. - In the opening introduction Greg Sorenson (ASWA president) introduced us to statistics surrounding this past LaNiña event, along with imagery taken from those areas most affected. As with every conference, the tradition continued with a dramatic and moving video package that covered many of the weather related events through out the year, donated by ASWA members. The introductory DVD will be made available for sale on our online shop shortly, so please watch for updates! Our first presentation was Clem Davis. Clem is a recently retired BOM forecaster who has given over 30 years of his life to the Bureau, and currently is a fellow at ANU, undertaking research in the field of climatic changes within the Canberra region. Clem took us through some of the features of Canberra region that influence the local weather and also gave examples for severe weather events that shaped how we view Canberra in terms of its’ weather history. Our second presenter was non-other than Anthony Cornelius. Anthony was on the forefront of the QLD floods during the lead up and as they unfolded at his forecasting role at Weatherwatch. Anthony gave a breakdown of how the tragic event played out and finished off with a tribute to the flood victims that brought a tear to everyone’s eye; truly inspiration footage of Australians helping out each other in a time of great need. After a nice coffee and tea break, people came back to watch some extraordinary footage of cyclone Yasi taken by Andy Barber and Cameron Hinzey, who attempted to document the build up from their relatively safe position of Townsville. We witnessed huge wind gusts, downed trees, foliage scattered, and storm surge and other insightful imagery of the mass exodus of people fleeing as Yasi approach the mainland. After our lunch break we took a ride back in time when ElNiño had Australia in it’s vice like grip. Major bushfires gave researchers like Rick McCrae (ACT Emergency Services Agency) a chance to unravel some of the secrets surrounding these super fires and what they mean for risk management for those in the path and those who fight these monsters. Rick’s presentation, Violent Pyro Convection looked at some of the processes needed to produce self sustaining supercells within the fire complex and phenomena such as pyro tornadoes filmed in the 2003 Canberra and Victorian bushfires. This presentation was truly eye opening - The footage of the pyro tornadoes are the only 2 known examples of these phenomena being filmed and they both occurred in Australia! For something a little bit different, Anthony Spierings from Energex presented the processes involved with operating a large electricity system during natural disasters such as the recent QLD floods. He showed the steps taken to ensure re-engagement of power following blackouts and infrastructure loss, whch can be applied to any power grid in the national. His talk proved extremely educational to those who weren’t familiar as to how we receive power and what the driving mechanisms are when we loss it. Next off the ranks was Rowland Beardsell with his talk outlining the severe weather outbreak in SA, 7th Dec 2010. This day was an historic day for SA, with not one, but 3 separate bands of severe storms with some individual cells becoming supercells according to dopplar radar; certainly it was a “one in twenty year event for SA”. As Rowland explained, the effect of LaNiña pushing inland troughs further east, caused more moisture and instability than usual to build up over several days in SA, triggering this outbreak. Our final presenter was Clyve Herbert who along with Jane ONeill, completed a recent successful trip the US and gave us jaw dropping footage and imagery from the other side of the Pacific. Their presentation not only covered many of the tornadic events during the past season, but also gave a glimpse in to the communities that reside in that part of the world. Tragically, Clyve and Jane witnessed the Joplin Tornado and the untold damage it caused to the city. Out of a mark of respect they chose not to show this footage for those who lost lives during this historic event. Through the course of the day, Clyve and Jane also showed us a rare interview with Sean Casey, IMAX movie maker for the upcoming film Tornado Alley coming to an IMAX screen in Australia in Sept this year. ASWA will be announcing a session time where we will have access to Sean himself as he joins us on the Australian release of his film in Melbourne and Sydney, so stay tuned for an announcement! This year we gifted Rams Head dollar coin sets to guest presenters, with a special Canberra Mint mark, as a token of our thanks for the effort in presenting to our audience this year. Our door prizes included an automated weather station kindly donated by Shane Ekerbicer, which was won by Trevor Burgess, so many congratulations Trevor –we hope it comes in good use! Other door prizes included 4 double passes to IMAX screenings and we hope people see something that they enjoy over the next 12 months. Congratulations to those elected, I’m sure the work that you will carry out will benefit ASWA throughout the next 12 months. Rounding off proceedings, Michael Scollay as always gave us an in-depth view of the financial report, which once again he carried out with flying colours. ASWA thanks Michael for his work in this area. By 7pm the attendee’s appetite for some good food was sated with a fantastic buffet dinner in the nearby Union Functions Centre, ANU, which provided seafood, cold cuts, salads, fruit, and a scrumptious selection of desserts. No one left without a full belly and smile on their face. After such an action packed Saturday, the following day was a day of recovery and having a social get together over a BBQ in the Park. Glebe Park, chosen for it’s central location, provided a great setting bathed in sunshine despite expected rainfall unbecoming. It was a last chance for our weather friends to say their last good byes, and well wishes for many, a long road ahead to get back home. This year’s event was such a powerful experience felt by all. We were touched by the tragic circumstances surrounding LaNiña and it’s impact upon people’s lives. However, what we gained in newfound knowledge & new friends made, one can only suggest that this year will go down as one of the most positive & best conferences that we have had since ASWA conception in 1998. ASWA thanks all those who presented this year, and to those who attended which made all the hard work worthwhile by ASWA volunteers. Next years conference will be held in QLD’s sunny Gold Coast and we will be announcing more details over the next couple months, so please watch this space! If you missed out this year, then here is your chance to plan ahead, and be involving what is the best day on the weather calendar in Australia! See you next time and have a safe and enjoyable upcoming storm season.